We can offer a range of services to ensure that all walls and surfaces are plastered to a smooth finish ready for painting and wallpapering. Rendering – external plastering to any exposed block or brick work. Coving – a decorative mould that is fitted along the top edges between the walls and ceilings of a room. 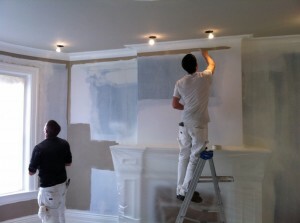 Plaster boarding – applying plaster board to a wall or a ceiling to achieve a level flat finish. Dry-lining – applying plasterboard to brickwork, masonry, timber or metal for a smooth finish.